"Hi. Since this is your first post..."
"Hi. Since this is your first question here, I thought I'd point you to some useful links. Take a look at how to ask questions here in such a way to maximise your chances of getting them answered and how to format math. Also, it's generally preferred that you show what you've already tried in attempting to answer your question." Although it's arguably verbose, I think the bit about maximising chances is bound to get the poster's attention. is there a flag/button/magic spell/dance that I can employ that will just add that comment directly with a single action? If not, can one be created? since math.se can detect first question posters then why not automatically add a comment along the lines of the above to the screen that the poster sees before he/she asks the question? failing 2, and again considering that first posts are detected, why not have a comment automatically added to a first question? Personally, I think (2) is the best solution. I can live happily with (1) as well. And (3) is a terrible idea in practice since it will pollute the comment area (unless the comment is visible only to the poster at the time of his/her first post, and to no one else). The solution that I'm getting very tired of is what I do now: keep browser tabs open to those two help pages and type the same comment every time. Yes, I could save the entire comment somewhere then copy and paste it as needed but, to me, that's nearly as bothersome as just typing the entire thing. Lastly, I did search Meta for a question resembling this one but I couldn't quite come up with keywords that would describe what I'm asking, so found nothing. The closest thing I know of with regards to your option (1) is AutoReviewComments, available as a Chrome extension, Firefox add-on, or userscript. You can also customize these, and introduce your own categories. As far as option (2) is considered, note then when asking a question some helpful information appears in the sidebar as you go through the various steps. While not even mod-editable, these are likely customizable. 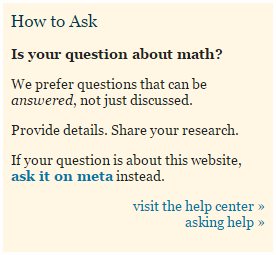 An additional link to our How to ask a good question page might be a good step. 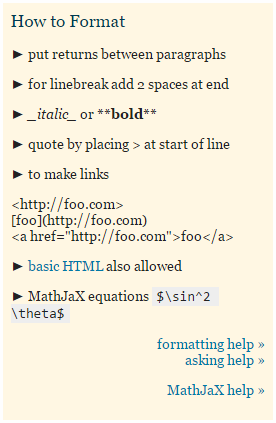 Of course, it could be argued that no-one ever reads the sidebars (let alone what they link to). The third option is probably the worst. Just because a brand new user asks a question does not mean that the question will be badly formatted or lacking other characteristics of good questions here. An automatic comment that almost assumes that the user is doing something wrong — and which might be obsolete the moment it is posted — is probably a bad idea. Not the answer you're looking for? Browse other questions tagged support feature-request comment .